Backpacking List Bible - More of a philosphy than anything else, and a back saver - go very, very light. Backpacking List Philosphy - Right now in the trunk of my neighbor's Ford Taurus is more stuff than is owned in total by a significant portions of the population of Planet Earth. As an American preparing your backpacking list, if you are an American, you have to consider that by and large Americans are the consumption hogs of the world. We own more, we acquire more, we possess more, and we even eat more. Having all that stuff is a personal decision for most people. But when it comes to carrying it on your back for 5 or 6 hours, stuff is a decided disadvantage. Because when the backpacking list is being prepared, the rule of the neophyte is "when in doubt, take it." Consider that the rule of the experienced is "when it doubt, leave it." Sometimes I don't even take a flashlight.What, really, are you planning on doing after dark, anyway? If the lightweight philosophy sounds lame, then you probably have more backpacking you need to do in order to develop the proper attitude. 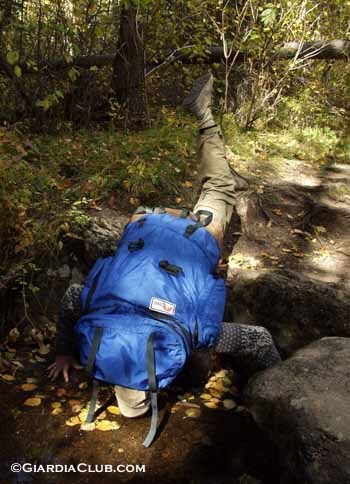 Because of all the criteria that is used to judge experienced backpackers from the majority of the rest, the weight of their load is one of the main ones. Tenderfeet haven't the discipline to lighten the backpacking list. Those who have had plenty of very long days on the trail - have.